« MUST WE DEBATE EVERYTHING? This was my fourth year volunteering at Rowe, and the crane viewing was the best I’ve seen. I flew into Kearney and was picked up by Margery Nicolson herself, the widow of the man for whom the center is named for, Iain Nicolson. I hit the ground running. Three hours after arrival, I was guiding a group to Stevie’s Blind, the first of the 19 consecutive tours I would guide. We were busy; for the first time, I experienced all 5 blinds being open simultaneously. I was in Jamalee 7 times, Stevie 5, East 3, Tower 2, and North 2. All the trips were good for crane viewing. 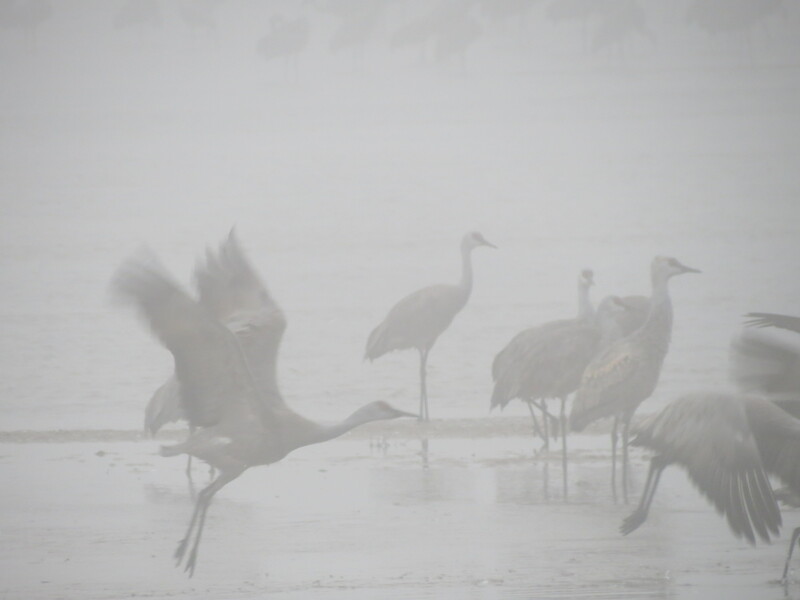 I got to see cranes in the fog one morning, which was very special, as the birds appeared like ghosts in fog as the light slowly increased. A few took off, but it was special, and there were remarkably few birds we saw, although we heard thousands more!! Crane taking off in fog. As a guide, I speak with my co-guide before we go to the blinds. In the evening, we have a lot of time, because we usually arrive at the viewing blinds 30-45 minutes before the cranes land. 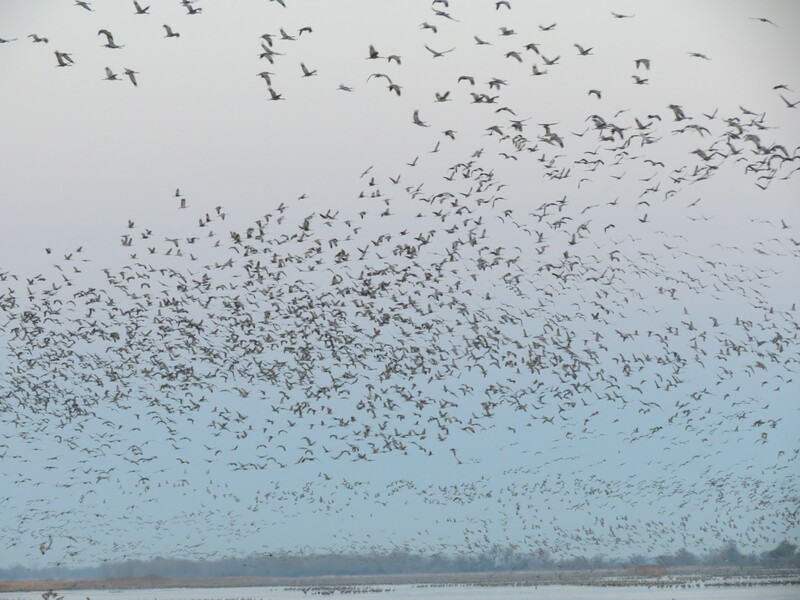 I try to show my enthusiasm at the beginning, then mention why the cranes come to the Platte every year. Then, I go through crane viewing etiquette. We have to be silent, nothing can protrude through the plane of the outside wall, and if anybody needs to use the Portapotty, they have to ask permission, so we can open the blind door quietly. We return in the evening as a group. Once people are in the blind, they must stay there unless there is a medical emergency. Those take priority. Personal inconvenience does not take priority over crane inconvenience. Those who are hungry, cold, bored, or otherwise not interested, thankfully a very small number, have to live with being on a tour for two hours. Photography is a big issue and at times a problem. All flashes must be turned off and even taped, if there is any question. The automatic focuser must be taped, so no light can show. This does not affect the photography. I ask for automatic rapid fire photography to be shut off, and only manual shutters to be used. I have had photographers brag about 8 GB of photos taken, and one person told me that he had taken 3000 pictures during one blind session, averaging 40 a minute. I have to wonder how many of these pictures are ever looked at over and over again, and how many pictures one needs of a Sandhill Crane, if that individual is an amateur. I find the sunsets striking, and the great flocks of birds flying at sunset are wonderful to see. On the river and a large group overhead. The problem with photographers can be severe at times. In 2011, one man had his camera lens protrude about 15 cm (6 inches) outside the blind window. I told him 3 times to bring it inside, and he got upset each time. The third time, he was visibly shaking with anger, and his wife had to calm him down. I have the right to make him sit down and take no more pictures. That is a personal inconvenience, not a medical emergency. 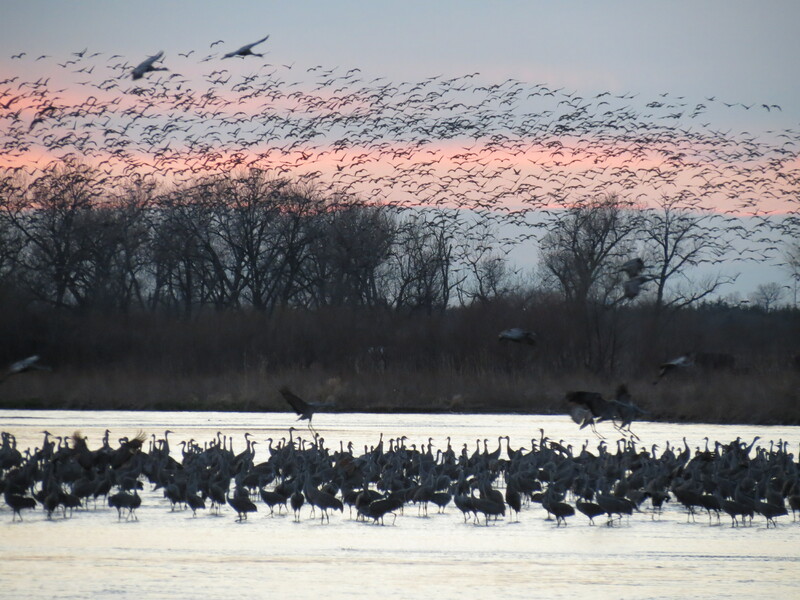 If we spook the cranes at night, they may hit nearby power lines and die. That must never happen on my watch. I have had people get angry with me for taping their camera, when they think all is fine. I ask them to point the camera at me and shoot a picture of my ugly face. If I see any light, I make them tape the camera shut. I have that duty. We put post-it notes over the LED screens, to decrease reflection off the face. The problem we are dealing with more and more is the sound from cameras, which clearly detracts from the experience of hearing the sound, at least until it gets too dark. There are three, two-person individual photography blinds at Rowe, but they are booked in advance, and the waiting list for cancellations is equally heavily booked. We don’t have a solution to this problem yet. Cell phones must be turned off as well. If we have time in the evening, once we arrive in the blinds, I can talk about crane facts. In general, however, more and more I allow people just to look and experience the phenomenon for themselves. The good guides I trained with did that, and I try to emulate them. Mornings are more difficult, because we need to get to the blinds early, before it gets light. Therefore, about the only things we can say are welcome, this is a wonderful experience, few know about it, and these are the rules. Large flock of cranes. The true words for plural are sedge, siege, or herd. But we use flock. In the blinds, if people have questions, they ask me, and I will spend as much time as I can with them, so long as they are interested. 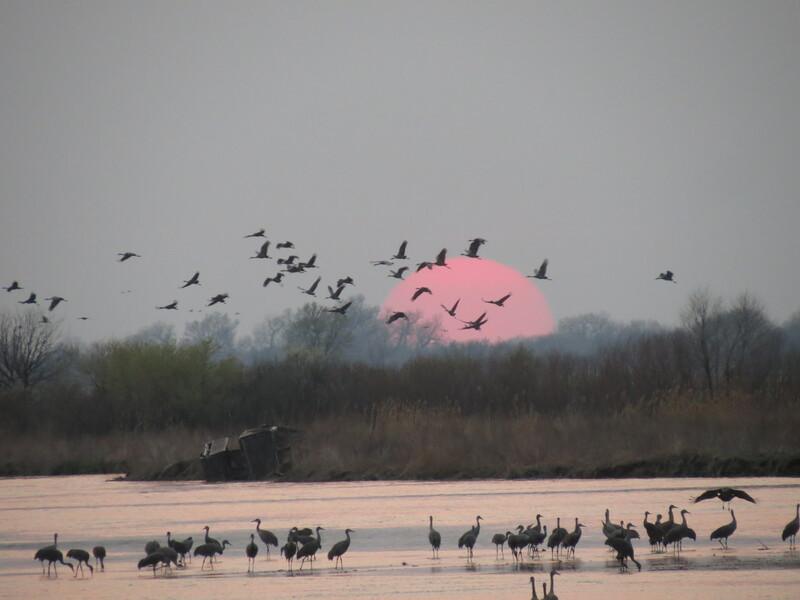 In the evening, we must leave as a group, because the cranes are on the river. In the mornings, we leave at 0830, but often, I or my co-guide will stay until 0900, for those who wish to view longer. After that time, there may only be two or three people, and so long as they are quiet, most of the birds are off the river, and it is not a problem for them to leave alone. I have other pictures, the best I shot, at the following link. I love the guiding, for I get to teach and watch cranes, and there isn’t much better in my life in Nebraska than those two things!! This entry was posted on April 12, 2012 at 08:37 and is filed under UNPUBLISHED OUTDOOR WRITING. You can follow any responses to this entry through the RSS 2.0 feed. You can leave a response, or trackback from your own site. You have explained this all so well. Thank you for your time and efforts to support America’s Greatest Migration. Rowe Sanctuary volunteers are the best in the world.